The constant worldwide increase in consumption of goods will also affect the textile market. The demand for cellulosic textile fibers is predicted to increase at such a rate that by 2030 there will be a considerable shortage, estimated at ~15 million tons annually. Currently, man-made cellulosic fibers are produced commercially via the viscose and Lyocell™ processes. Ionic liquids (ILs) have been proposed as alternative solvents to circumvent certain problems associated with these existing processes. We first provide a comprehensive review of the progress in fiber spinning based on ILs over the last decade. 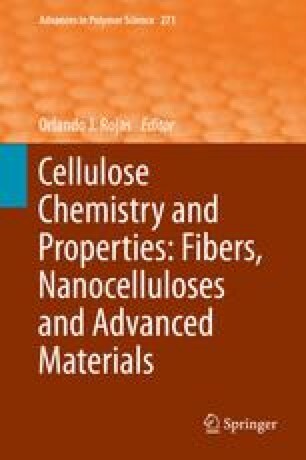 A summary of the reports on the preparation of pure cellulosic and composite fibers is complemented by an overview of the rheological characteristics and thermal degradation of cellulose–IL solutions. In the second part, we present a non-imidazolium-based ionic liquid, 1,5-diazabicyclo[4.3.0]non-5-enium acetate, as an excellent solvent for cellulose fiber spinning. The use of moderate process temperatures in this process avoids the otherwise extensive cellulose degradation. The structural and morphological properties of the spun fibers are described, as determined by WAXS, birefringence, and SEM measurements. Mechanical properties are also reported. Further, the suitability of the spun fibers to produce yarns for various textile applications is discussed. This study is part of the Future Biorefinery program financed by the Finnish Bioeconomy Cluster (FIBIC) and the Finnish Funding Agency for Technology and Innovation (TEKES). The authors would like to thank Anders Persson and Anders Berntsson from the Swedish School of Textiles (University of Borås, Sweden) for their kind assistance with the yarn preparation.